Too hot to handle indeed! 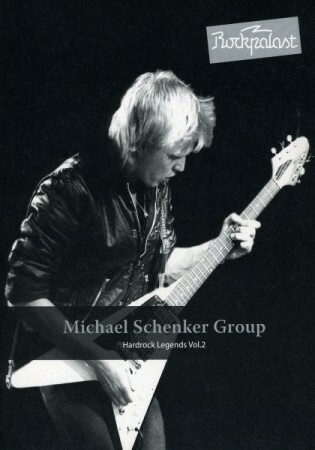 If you ever wondered what all the fuss over Michael Schenker's guitar playing was about, then check out this 1981 MICHAEL SCHENKER GROUP (MSG) performance from 1981 and all questions will be answered. "Hardrock Legends Vol. 2" captures MSG on January 24th at the Markthalle Hall in Hamburg, an event originally broadcast on popular German television show "Rockpalast". As the saying goes, it was a night to remember. Not long after completing a string of classic UFO albums during the '70s and having made a successful transition to solo artist, Schenker is a man on fire this evening. But he's not the only one raising the room temperature. Vocalist Gary Barden, bassist Chris Glen, keyboardist/guitarist Paul Raymond (UFO), and drummer Cozy Powell (RAINBOW, JEFF BECK GROUP, BLACK SABBATH, WHITESNAKE, etc.) put on a performance that is almost without flaw. All the musicians on that stage came to conquer, but along with Schenker the late Powell brings his "A" game. His approach to the kit is both powerful and intricate, making the viewing an experience that is bittersweet. Most of the set list consists of songs taken from MSG's excellent self-titled debut album, not the least of which includes "Armed and Ready", "Cry for the Nations", and a great instrumental called "Into the Arena" during which Schenker lets it all hang out. The set is (more than) rounded out by UFO classics "Lights Out" (the set closer), "Doctor Doctor", "Rock Bottom" (a 10-minute Schenker showcase), and a song in "Natural Thing" that features one of the greatest riffs ever written, one guaranteed to get asses out of the seats and moving. Schenker is in his element here; that recognizable Flying V tone, the fluidity of his playing, and the way that he can make a solo sound wild and classy at the same time. More than just superb performances, the members of MSG as a whole are giving it 110 percent and appear to be having a grand time doing it. That energy is infectious, something you'll feel even from the comfort of your armchair or futon. The sound quality is just fine too. While the lighting doesn't do the video production any favors, the issue is a minor one. Otherwise, if you are an MSG fan, a Schenker fan, and/or a lover of melodic heavy metal and hard rock, then you need to see "Hardrock Legends Vol. 2". This is prime time Michael Schenker.